Board of intermediate and secondary education Bise Abbottabad recently announced their Matriculation and Intermediate results session 2018. The Inter and Matric students can submit application form for retotaling their papers. The students whose not got good marks in their exam paper can submit application for checking their numbers, because many times the totaling error was fund during the counting the numbers of papers. So it’s a chance for all students of bise Abbottabad that they can submit application form for rechecking or retotaling their paper marks. The annual examination result was announced recently, so many students are thinking that the counting or checking paper was a problem due to this their paper marks is not counting fine, and having tension about their paper marks can submit retotaling application form today that Board will work to retotaled their marks. 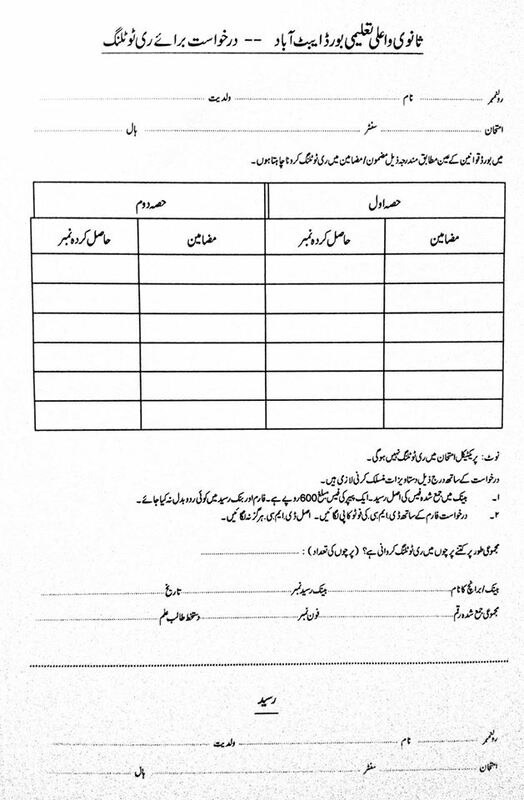 The retotaling application a form was given below just download this application form and fills it with proper attention. After this go to bank and submit Rs. 600/- per paper take bank deposit slip from bank for attachment with application form. And kindly don not write any think on deposit slip just fill application form. After that go to Bise Abbottabad office and submit application form with related documents as early as possible during Bise Abbottabad office timing. after submitting re-totaling application form to the Bise Abbottabad Office must take Slip from office for further reference.